Due to a lack of documentation and possiblities to deactivate these “secure execution environments” those can’t be disabled on our own. If you are interested you can read some more details about Intel ME/iAMT and AMD Platform Secure Processor / AMD Secure Technology. This article is providing an overview about possible solutions. The order is unintentional. You might want to have a look at the quick overview about how open and secure computing technologies. AMD PSP / AMD Secure Technology is integrated into all CPUs produced after 2013. On AMD systems with BIOS or UEFI the AMD Generic Encapsulated Software Architecture (AGESA) code is responsible for releasing the CPU from halt state during boot initialization and allowing it to start up and work properly. This is a binary proprietary firmware blob, which is needed for the machine to work. The AGESA documentation states that the macro called “AMD_RESET_ENABLEMENT” initializes fundamental controls which have to be placed as early as possible in the boot sequence. This marco initializes DRAM through PSP. 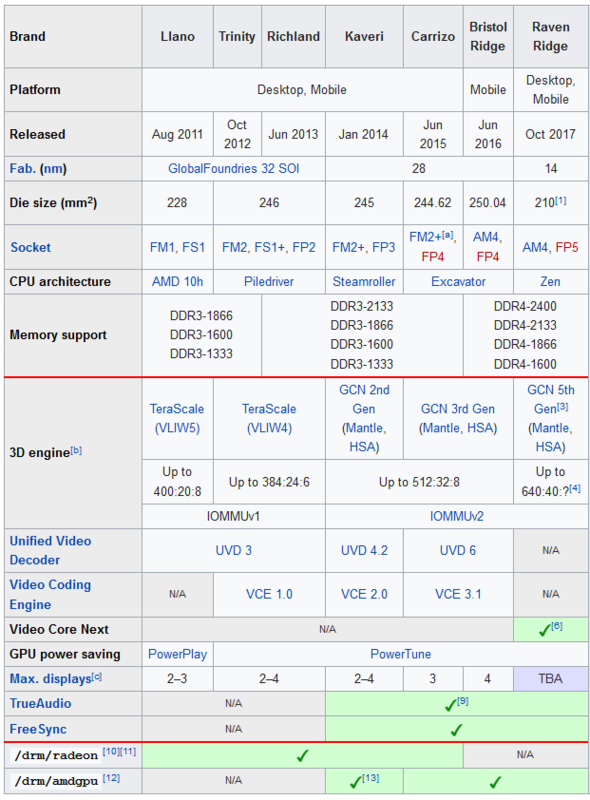 On page 158 of AGESA is written that “Family 16h and Family 15h-Models 60h and later contain a PSP but it does not perform the memory initialization”. Knowing this details we know what for we should look for – anything before Familiy 16h and Familiy 15h Models 60h. We start the examination with the latest generation. The BIOS and Kernel Developer’s Guide (BKDG) for AMD Familiy 15h Models 60h -6Fh Processors describes the PSP as an integral part of the System Management Unit SMU (page 159). So this generation class 4 isn’t meeting our requriements. Outch!!! We found the PSP within Family 15h Models 30h – 3Fh! Looks like the AGESA documentation is faulty and misleading us! We decide to trust the official data sheet more than the AGESA docs. OK. Let’s head on to the generation prior to this one.. and finally.. in the product data sheet of Piledriver CPUs (02h + 10h – 1Fh) we really can’t find everything about the PSP. Cool! Looks like we’ve found the holy grail. The feature-set is looking very similar to those features as mentioned above. The fastest one is the AMD A10-6800K and is availabe for around 50-60 $. But because of the lack of performance you should focus on other solutions. Formerly known as LinuxBIOS this project aims to replace the proprietary BIOS firmware. Users should notice that Coreboot still uses proprietary binary code for initialization as well. In almost every configuration which is listed under supported mainboards there is proprietary code included. That means in the end parts like Intel ME are still running without limitation so using Coreboot isn’t a real alternative if your aim is to run an system without Intel ME or AMD PSP / Secure Technology. You should focus on other solutions. Libreboot is a free BIOS and UEFI replacement which aims to completely omit any proprietary binary blobs within the firmware. Unfortunately you have to deal with flashing the correspondent chip on your own. In all cases you should know that you may brick your device while playing around with your SPI flash chips. Management engine / TEE free? Those distributions of GNU/Linux are typically based on a kernel called Linux-libre which is used by default. Completely free (as in freedom)?